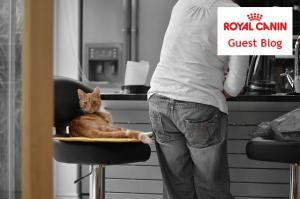 Here at Royal Canin we recognise the frustrating position many owners are put in when faced with a cat that refuses to eat its usual dinner. Although it may be painful to hear, refusal of food is not a natural behaviour that occurs in healthy cats. Unfortunately, most fussy feeding behaviour is actually a learnt response to human behaviour, as we (the cat’s owners) over-pamper our pets. Obviously, if you are concerned about your cat and it is losing weight or has refused to eat anything at all for a period of 24 hours or longer, we would advise seeking your vet’s advice immediately. Cats going without any forms of food at all are at risk of developing serious problems with their liver and total voluntary starvation can indicate serious problems. However, if your cat is just one of the fussier ones, please don’t worry – we are all guilty of a little over-pampering of our pets at times! By reading this article give yourself a pat on the back for taking the first steps towards helping your pet out of this sticky situation! Why not follow our top tips for fussy felines below, which should help to diffuse the situation before it becomes a regular occurrence? 1) Speak to your neighbours to ensure they are not feeding your cat. If your cat’s fussiness has started recently, it may just be down to the fact that your cat is receiving novel attention and different food elsewhere and would rather go there because things are newer and more exciting. It may even be worth dropping leaflets through your neighbours’ doors with a photo of your cat on, asking them not to feed your companion if you are struggling to speak to them directly. 2) Give your cat food you know it has eaten before. Feed your cat twice daily at regular intervals (more often if it is growing) and only leave the food down for 20 minutes, unless your cat shows an interest in it. Cats can be “natural grazers” and eat throughout the day – if this is the case don’t worry; this in itself is not a fussy behaviour. The most important thing with “natural grazers” is to ensure they don’t overeat. Avoid continuously topping up their bowl as soon as it is empty but remember to only serve their recommended daily allowance per day. However, if your cat has become fussy and won’t eat at all unless tempted with varying foods, trying the 20 minute rule for a day or two should help them to break the cycle. Keep an extra close eye on your cat during this time to ensure no one else is feeding them! If after 24 hours your cat has eaten nothing at all, it is definitely worth speaking to your vet for their advice. If your cat is in good health, your vet will probably recommend giving a small tempting meal and then returning to the protocol as before. This will probably set your cat back at little but hopefully with some perseverance you will still succeed in the end. - Firstly do you add some gravy to your cat’s food if it is not eating? Does your pet eat the gravy-soaked food for a few days then go off it again? - Do you then add something else like chicken or tuna only for your cat to eat it for a few days and then go off it again? - If this is sounding familiar – please stop now! Not only by adding these sorts of things to a diet will you cause dietary imbalance but you will also gradually make the situation worse for yourself. Take a firm stance and try step 2 (above) and see how your cat gets on. 4) Make sure food bowls, water bowls and litter trays are spaced widely apart within the house – as a general guide they need to be at least 1 metre apart - more if possible. Cats do not like to eat where they go to the toilet and naturally would never contaminate their water sources with their food. By doing this, mealtime will become a lot more appealing for them. 5) As a last resort, you can try gently warming your cat’s food (if it is wet) or adding a very small amount of tepid water to it (if it is dry food). This may help to increase the aroma and the appeal of the diet for your cat. Remember, whatever happens, it is important to persevere, not to give up hope and to seek veterinary advice if you have any concerns at all. It is also vital to understand that our pets do not perceive what they are eating in the same way we do. It is also a misconception that a cat may not like a certain cat food or will get bored of it. Cats have far fewer taste buds than humans do and eat more out of necessity than pleasure, so will be quite happy to eat the same food repeatedly. To a cat, the most importnat factor when selecting its food is the nutrient profile of the diet. Obviously, all of the Royal Canin diets have been produced to fulfill all of your cat's nutritional needs (and more!) and have been developed so they are very well suited to your cat's palate. Article courtesy of Royal Canin. Thank you soooo much. Been dealing with cat with colitis and this article helped me when getting her to change food.